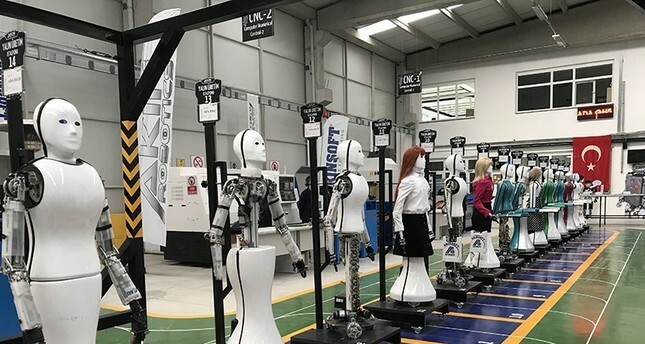 Turkey's first factory which will produce human-like robots opened in central Konya province Saturday. AkınRobotics, a humanoid robotics factory, was established by AkinSoft software company. The factory has started mass production, said AkinSoft Board Chairman Özgür Akın, speaking at the inauguration ceremony, which was attended by employees and technology enthusiasts. He added that none of the robot factories around the world have yet started mass production. The new generation human-robots -- named "Ada GH5" -- will be programmed for use at malls, fairs, airports, hospitals, and even at homes, Akın said. The robots produced in the factory are able to process what they hear, speak, smell, and use the internet, Akın said, adding that they also recognize faces. Meanwhile, the President of KTO Karatay University Professor Bayram Sade said that the university aims to cooperate with the factory and contribute to its projects through internship programs.